The Mount Pleasant Post Office was built in 1940. Inside is a mural entitled "Early Settlers Entering Mount Pleasant." It is a tempera and oil painting done in 1942 by Eugene Higgins. The painting measures 12'6"x 5'3". Eugene Higgins was born in February 1874 in Kansas City, MO; he died on February 18, 1958. 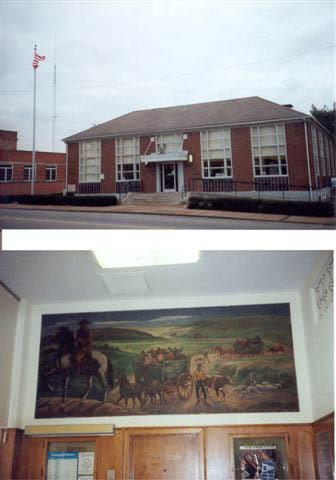 He also did a mural for the Beaver Falls, PA Post Office.